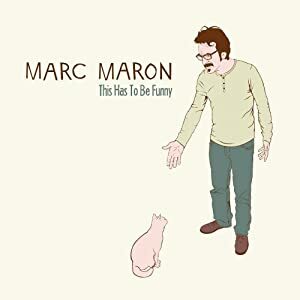 Marc Maron is releasing his fourth CD today on Comedy Central Records. "This Has to Be Funny" is available as a CD or mp3 download. (BTW, for long-time Maron followers, that's his cat Boomer on the cover). Recently, Marc gave the keynote address at the annual Just for Laughs festival in Montreal. (You can find the text and the audio here). The speech is a moving commentary on the importance of continuing to believe in yourself, and continuing to do good work, even when times are hard. It sends an important message to creators everywhere: Never give up. Congrats to the team behind "It's Always Sunny In Philadelphia"! FX recently picked up two more seasons of "Sunny" which will make it the longest-running live-action comedy on basic cable. The show will return to your screens on September 15th and later this fall our Canadian listeners will be able to join in the fun as the network plans to launch FX Canada on November 1st. Speaking of FX, we're also getting excited about the upcoming season premiere of the quick-witted animated spy comedy "Archer" featuring TSOYA alums Chris Parnell and H. Jon Benjamin. The network will air the first three episodes of the third season in mid-September reserving the rest until early 2012. If you haven't been following the adventures of Sterling Archer, you're missing some of the fastest and cleverest dialogue on television. You can check out the first season on Netflix, but I recommend buying the DVD of that season as it features some very funny and unusual bonus materials. The movie "30 Minutes or Less" featuring Jesse Eisenberg, Nick Swardson and TSOYA alum Aziz Ansari will be released on August 12th. Kids in the Hall alums Kevin McDonald and Scott Thompson are touring comedy clubs around the nation with a new show called Two Kids, One Hall. The show, which will feature stand up and sketch elements, as well as an appearance by favorite classic character Buddy Cole, will tour for about three months. Their next performances will be August 11th - 13th at the Punchline in Atlanta. If you want to know when the show is coming to your town, you can check out their tour dates here. In order to build anticipation around the upcoming new Dr. Who episodes that will begin airing on August 27th, BBC America is releasing a series of Who-themed specials featuring a diverse plethora of TSOYA alums including Chris Hardwick, Reggie Watts, and Scott Adsit. The first special, "Doctor Who: Best of the Doctor", will air on Saturday, August 13 at 9/8c.